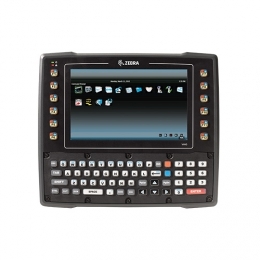 Developed for harsh environments and adverse conditions the robust vehicle computer Zebra VH10 is compact, robust and, thanks to its fully-fledged keyboard with 12 illuminated function keys and 8 touch display, it practically offers the full functionality of a computer with a Windows operating system. Whether integrated or as a forklift terminal, the VH10 is ideally suited for operation in warehouses, production and transportation. The freezer version guarantees frost-free, condensation-free operation in freezer environments down to -30C, thanks to its integrated heating element for the touch screen and circuit board. Compact sizes and variable mounting options make installation simple - even in the smallest vehicles. Thanks to the integrated back-up battery, you bridge power failures of up to 15 minutes. This reduces both waiting times for logging out and connection set-up to a minimum, as well as complete production failures. Equipped with WLAN 802.11a/b/g/n, narrow band radio UHF and Bluetooth 2.0, the VH10 is continuously wirelessly connected - independent of obstacles in the surroundings, which could interfere with the connection.